Cleanliness is next to fidelity when it comes to vinyl, but where on earth did this device get its name? Okki Nokki distributor Ken White has been selling second-hand records since the nineties, so he knows a thing or two about filth, enough it would seem to have sought out this strangely named machine and decided to bring it to the UK. It's certainly priced right at £395 – we don't know of a cheaper alternative that has built-in vacuuming capabilities and the ability to spin in both directions. Not only that, but it comes complete with concentrated cleaning fluid and a goat's-hair brush. The name, incidentally, is Dutch for 'thumbs-up'. The true test of a record cleaner is how well it achieves its aim and how much effort is required to do so. But that's not all, there is also the question of reliability. A lot of cleaning machines need to have their reservoirs drained quite frequently – as often as every eight to ten records – this is because excess fluid will eventually work its way into the vacuum motor and damage it if not removed. One very useful feature of the Okki Nokki is that it has a float mechanism, that stops it operating when the fluid needs to be drained, so there's never any danger of water getting into the motor. Which given its electrical nature, has got to be a good thing. Operation is via two switches: one for forward/reverse and the other for suction, but first you need to dilute the cleaning fluid in a litre of condensed water and then pour a little back into the bottle which has small spout for ease of use. Inconveniently, this bottle has no lid so needs taping-up. The fluid itself is soap rather than alcohol-based and doesn't require rinsing. 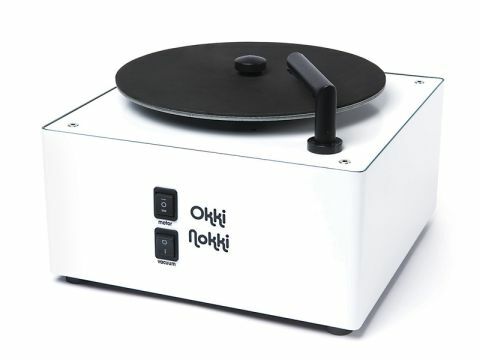 The Okki Nokki is rather attractive in its white finish and it's not too big. More importantly, the vacuum motor isn't excessively noisy and does the job quickly. It's not as well finished as the Hanns Acoustics RC20 we looked at last year and doesn't look or feel quite as solid, but it's substantial enough for the job, even if the clamp is a little basic. The supplied brush is good quality and parts like the suction arm are very nicely executed, alternative length arms for seven- and ten-inch discs are available, as are replacement velvet strips which stop the tube damaging the vinyl. Another useful option is a dust cover at £49.95 – the last thing you want is dust on the foam-faced platter. The cleaning process is pretty straightforward and once you've done it a couple of times, it's not too slow either; you can do what it suggests in the manual in about a minute per side. With dirty records, this process needs to be repeated up to three times and it's necessary to scrub for a bit longer than the indicated two revolutions. The result is that vinyl sounds relatively 'fresh' because the highs are clearer, which not only adds sparkle to the treble but brings greater definition across the range. Both an ancient Nina Simone album and a more recent Joni Mitchell one benefited quite obviously and curiously, a second clean proved worthwhile, even if the law of diminishing returns had started to kick in. It also gets rid of some sources of noise such as pops and clicks, not the ones caused by actual damage of course, but by larger deposits of detritus. There is no such thing as a record cleaning machine where you put a dirty record in at one end and get a clean one out at the other, they all require a fair amount of elbow grease. The Okki Nokki works as well as any we have tried, but costs less and has a safety feature that should stop users from inadvertently damaging it. Record-cleaning is not the most fun you can have with your clothes on, so an affordable machine that makes it painless is very welcome indeed.